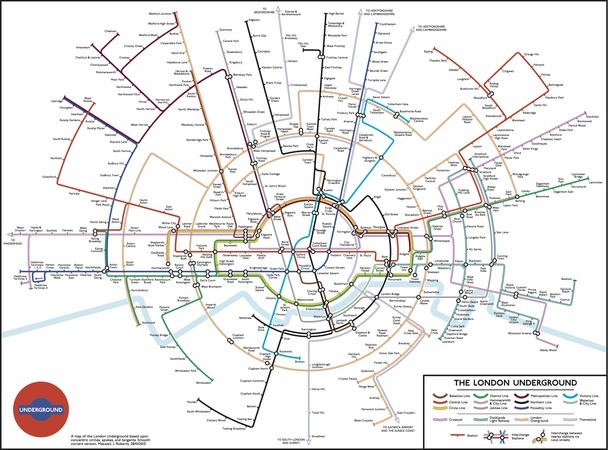 Last week, Jonathan Fisher sent us a reworked Tube map, which presented the network as a series of concentric circles. Max Roberts, a long-time experimenter with the Tube map and author of Underground Maps Unravelled, has pushed the design further, increasing the number of concentric sections and — most pleasingly — spacing out the central section to resemble the famous Tube roundel. Note also that the map includes the Thameslink line and the forthcoming Crossrail — both of which are absent from TfL's standard Tube map. As Max explains over on Annie Mole's blog, this is intended purely as a bit of fun, to see how resilient the map is to such tamperings. "I don't think I will be sending this one to TfL for comments," he says. "No great advances in usability here, but it was fun to make it." See our comprehensive guide to alternative Tube maps.